DEXA bone densitometry is most often used to diagnose osteoporosis, a condition of gradual loss of calcium, causing bones to become thinner, fragile, and more likely to break. Post-menopausal women are often affected, but it may also be found in men. Heredity has been shown to be a significant indicator for developing the disease. Densitometry is today’s established standard for measuring bone mineral density most commonly by viewing the lower spine and hips. 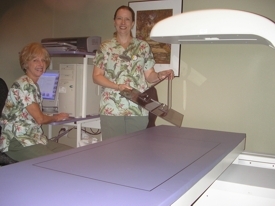 Visalia Women's Imaging Specialists uses the Hologic brand unit which is known for a high level of accuracy. This is a quick, painless procedure for measuring bone loss and contrast injection is not required. The results are interpreted by the radiologist using two scores: The "T" score number shows the amount of bone you have compared with a young adult of the same gender with peak bone mass. The “Z” score reflects the amount of bone you have compared with other people of comparable age, size and gender.